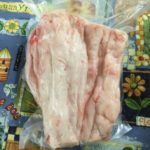 We are providing ground or slab back and leaf fat, for home rendering into lard. It will be in 5 pound increments. Flash frozen, shrink wrapped and course ground. Getting it ground is really nice. You do not need to cut it up and it renders really easily. I rendered this fat for my baking and it turned out great! I was really surprised as to how easy it was to do. 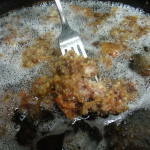 I used a slow cooker/crock pot, added 1/4 cup of water to the 5 lbs of fat that was thawed. Turned it on high. I went shopping for 4 hours, yes I said shopping. When I came back, the meat scraps and connective tissue turned brown and some settled to the bottom. Let the lard cool for a bit and then strain through cheese cloth or cotton fabric. 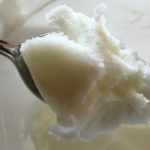 The melted lard will be yellow, but when it cools in a shallow pan, or glass jar, it turns creamy white. 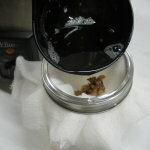 Look on my recipe page for photos and process of rendering this fat into lard. 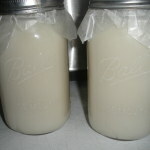 5 LBS of fat will yield 8 cups of lard. Place in refrigerator or the freezer , for up to a year. First of all, I am very pleased that I received my order of hog fat/leaf fat so quickly; it took a mere few days to arrive. I ordered a total of 15 pounds and rendered all of it the same day it was delivered. Following Dawn’s crock pot method, I was amazed that it was so easy and largely a hands-off process! 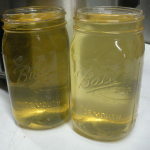 The end result was six quart-sized Mason jars of lovely snow white lard and about five cups of delicious pork cracklings! Now my freezer is well-stocked and I am a happy woman! Praise the lard! I cannot imagine baking without this lard!! I just have to giggle when folks say my baked good are so good and ask what I do. The look on their faces is priceless when I tell them I use lard!! But they sure keep eating! I cannot imagine doing with out it. PPF’s is the best I have found. I prefer the already rendered, since I don’t have the time to do it myself.